Last week, Speckles ripped one of her nails off . . . the ENTIRE thing, quick and all! Tuesday afternoon, Speckles was laying near the open sliding glass door as she normally does. Somehow, her nail must have slid into a small opening and, when she tried to get up, it got caught. Unlike with a child, there was no way to tell our dog to calm down so we could come over and help her get free. So, Speckles immediately started to FREAK out. Accompanied by a series of blood-curdling yelps, she frantically jerked her arm back and forth until her far right nail came completely off with her nerve ‘stuff’ still inside. (I’d show you a photo but I don’t want to gross you out THAT much.) Before we even knew what was happening, Speckles limped over to her bed and tried to hide blood spewing all over. Frans grabbed a bunch of towels and I moved quickly to wrap her paw and apply slight pressure to stop the blood flow. We called the vet but, of course, it had to be 1:00 pm and they were closed for lunch until 2:00pm. We didn’t know if we should wait until the office opened or take Speckles straight to emergency. We called the emergency clinic for some advice. Fortunately, we were told to just do our best to stop the bleeding, use some cornstarch if needed, and wait for our regular vet. If the bleeding didn’t stop, then we could head to the emergency clinic (that’s always more expensive though). The bleeding did slow and, as soon as it turned 2pm, we jumped in the car and headed for the vet’s office in Redwood City. I called to let them know we were on our way with a quick summary of the situation. They happened to have an open appointment and we only had to wait about 10-15 minutes before Dr. Stiglich came in. She said that the nail probably wouldn’t grow back but that everything else looked okay. Dr. Stiglich took Speckles to ‘the back’ to trim the nearby fur, clean the wound, and apply a soft bandage (she chose to use the zebra print 😛 ). We had some anti-inflammatory/pain meds for her already so the vet said we could give her a bit of that if she needed it. The bandage could come off in four days. I was relieved that the vet only charged us $87 for the visit and supplies. 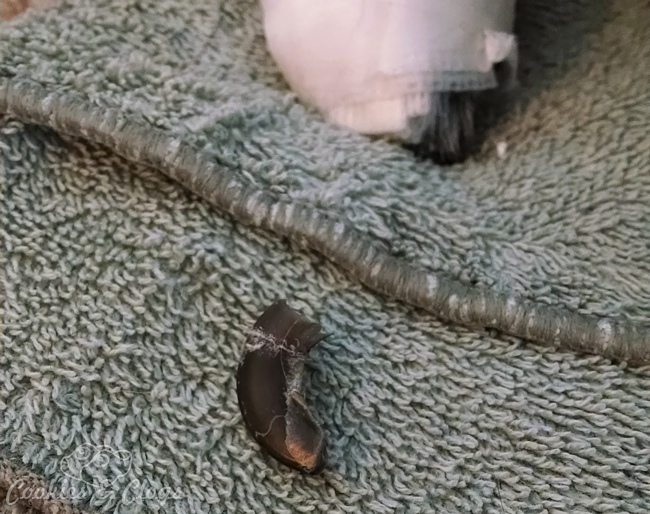 To prevent this from happening again, our vet encouraged us to get a nail grinder. We could only bring Speckles to get her nails trimmed every 3-4 weeks because she hates getting her nails trimmed with a vengeance. With the grinder (which doesn’t phase Speckles at all), we can use it more often so her quicks recede. Then we can keep her nails shorter, preventing them from forming a hook-like shape and geting caught under things like sliding glass doors. The carefree animals that dogs are, the whole ordeal is over and done with for her. Speckles was initially worn out from the experience but has been healing fine. When taking her out to do her business, we’d pop her paw in a plastic baggie and secure it with a loose rubber band to keep the bandage dry. Oh wow that would be so scary! I’m glad Speckles is okay. Not with just a little clip but when they get their nail caught on something and rip it totally off, then it’s a bloody mess! Poor little girl! I knew you had to be careful with cutting them, but goodness I didn’t know anything like this could happen. It scares me to clip our puppies nails. I hold him and my hubby clips, but we found a groomer that we will be taking him to once a month to clip them. After reading this, I’m positive I do NOT want to clip my pups nails. 🙂 Glad Speckles is alright. 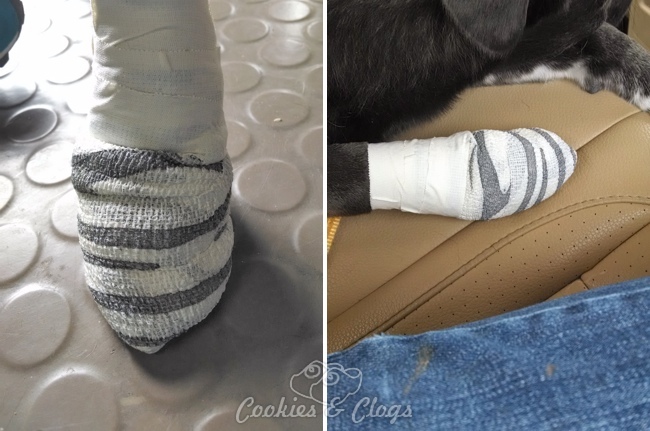 Sorry your pup had a painful booboo! Kind of like an electric nail file. I just ordered one so I’ll put up a tutorial when I figure it out! The poor baby. I have to say the little clawless toe is kind of cute though. Aww.. thanks for sharing this story we have a dog whose nails are too long so I’m going to check out the grinder. OMG. That is terrible. That’s why I pay someone to cut our dogs nails. I’m too afraid. Poor baby. I would have been freaking out. Glad to hear she is is recovering well. Poor Speckles. This happened to one of our ferrets once and there is no way to te;ll them to calm down either. So glad it is all better now! Our Tory had really bad nails, she hated getting them cut, the Beagle yelped for hours! I have to let the hubby deal with the dogs nails. I can barely clip baby nails without breaking into t sweat. Ouch! Poor baby! I have long nails and when they break, it hurts! Oh no! Poor thing… I’m glad she’s better. Oh no! Poor thing. That must have hurt so badly. I’m glad she’s OK now. Poor thing. I can’t even imagine the excruciating pain she must have felt. Glad she is OK and you have an option to help prevent this from happening again. For me this is just one more reason not to get a dog. Kids are enough to worry about. Poor little thing!!! That would be so painful!!!! Glad the bandage came off and so far so good!!! I stumbled on your post. A very similar thing just happened to our puppy. 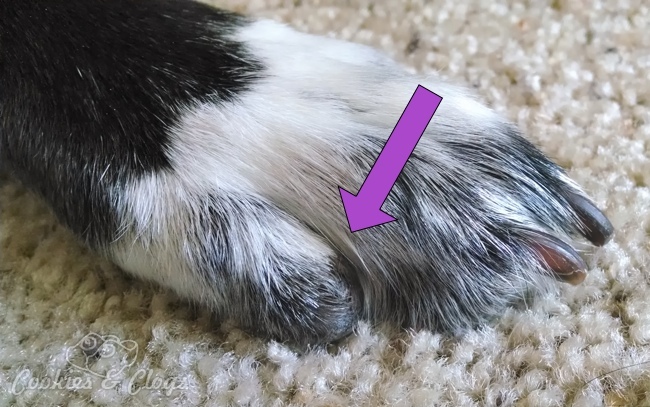 Did your dog’s nail end up growing back? Yes, it did! We weren’t expecting it to but it grew back just fine.